… is Cafe Blossom on the Upper West Side. Don’t take my word for it – Time Out New York rated Blossom – the best vegetarian restaurant in NYC two years in a row (2008 and 2009). I know, I know – vegetarian and vegan are different, but Time Out Magazine probably does not have a category for Vegan restaurants when they do their annual evaluation of restaurants. I went to Cafe Blossom on the Upper West side for lunch a few weeks ago on a rainy summer afternoon with a vegetarian friend. We both left with full stomachs and heavy hearts (we could not eat any more of their delicious dishes that day 😦 ). Cafe Blossom is a quiet place on a week day for lunch. 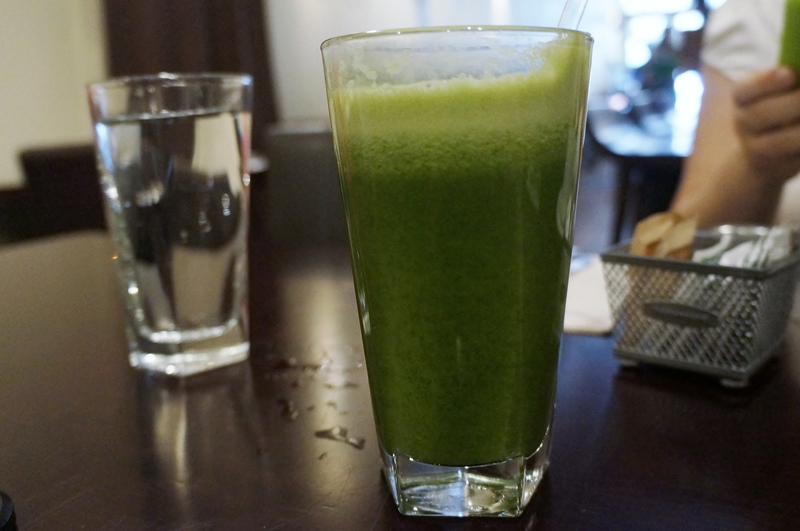 I was pleasantly surprised by the sweetness of the Field of Greens juice that I had while I was waiting for my friend. It had just the right amount of spinach to make it look green and healthy, a reasonable amount of ginger to make it spicy, just the right amount of apple to make it sweet enough for me, lemon juice to make it tart, and cucumber to make it very fresh!! I wish the other green juices of the world (Hint: Juice Press, Blue Print Cleanse) would learn from this combination to recreate the perfect taste and to let people in the world know that healthy = tasty too! Black-eyed pea cakes: I am an ardent potato lover and I relish black eyed peas. The soft, cooked black-eyed peas were stuffed in the steamed, mashed and spiced potatoes that were crisp on the outside and super soft inside. 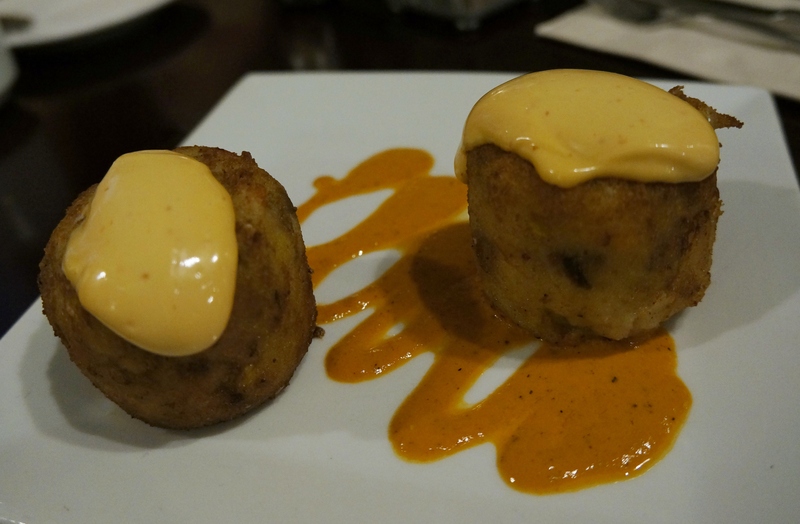 The garlic aioli (am assuming this is soy aioli, did not confirm with the server, sorry) was wonderful as was the flavorful red pepper coulis on the plate. 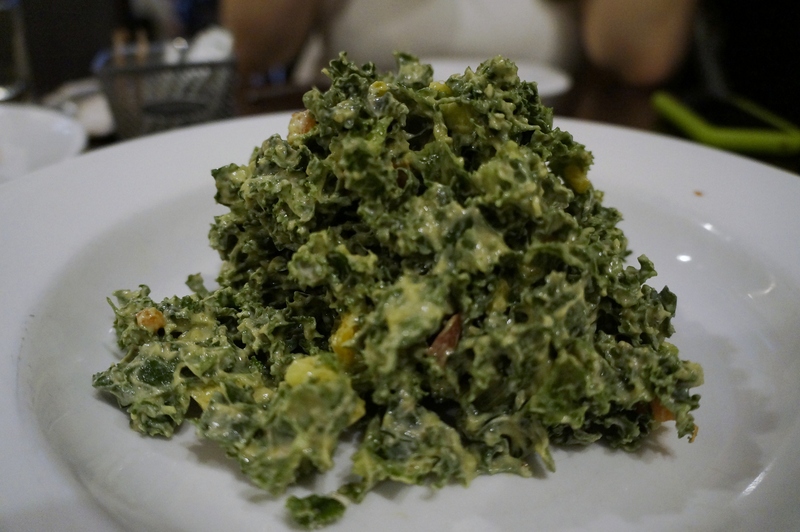 Kale salad: If you do not like eating kale, you will become a convert after eating this salad. With avocado and ginger-almond dressing – this is absolutely delicious!! At the restaurant, you can order a side of kale – raw or steamed. If it’s kale you want to eat, please eat this salad instead of the raw or steamed kale. When I ate this salad, I was reminded of a couple of kale salads that I make, although I must admit that those are very different. Watch out for a future post on the kale salads I make (and love!). Autumn Sweet potato rolls: Did I mention that I am ardent lover of potatoes? But am not one of sweet potatoes. This dish convinced me to try eating sweet potatoes a few more times. 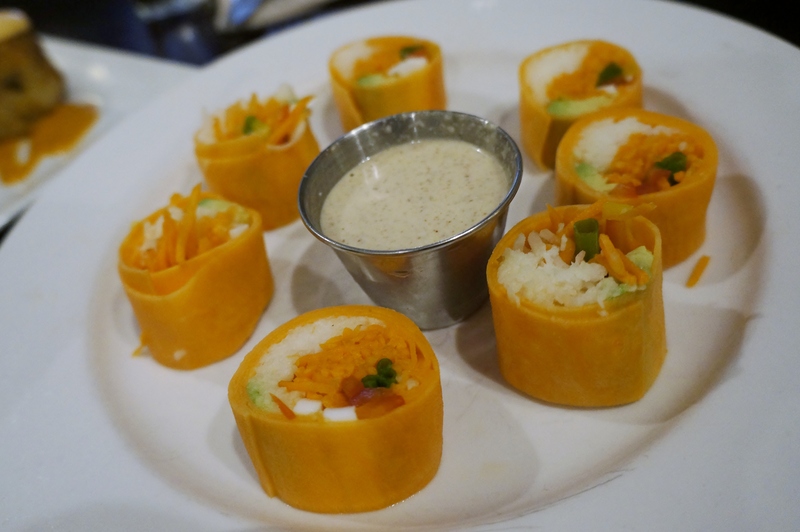 The sweet potato is the orange colored savory wrap around the coconut noodles, jicama, red and yellow peppers, carrots, scallions, and avocado. Yum! These 3 dishes were perfect as lunch for us – not too large and yet very filling appetizers. I am now struggling to pick one favorite dish from these listed above. Please go to Cafe Blossom, try these and tell me what is your favorite dish? At Cafe Blossom, a few dishes are raw and a few are live. My friend and I were intrigued by the raw Beet ravioli (with herbed cashew cheese, sprout and carrot salad) – how can ravioli be raw? The server mentioned that the cashew cheese was wrapped in thin, raw beet slices. I made a note to try this dish the next time I eat there. The portions at Cafe Blossom are by no means small at the restaurant; one appetizer and one main course will make for a hearty meal for anyone. 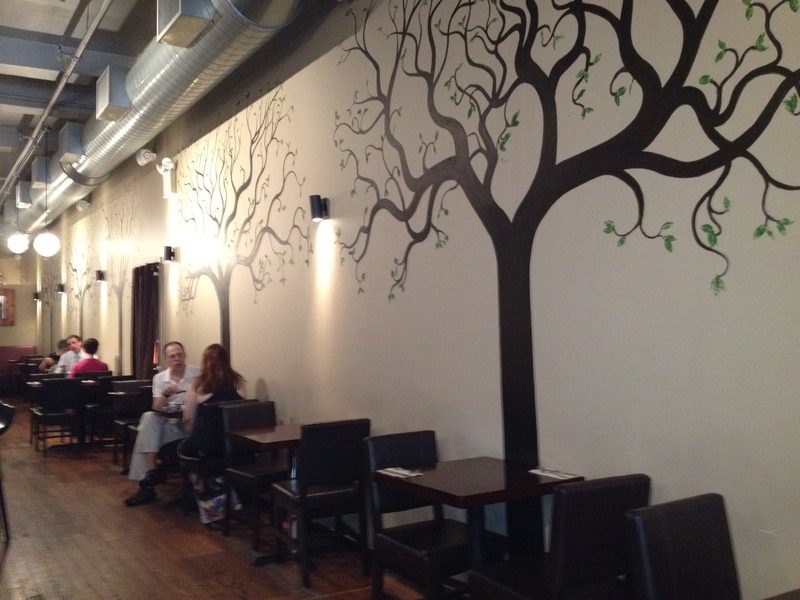 Many Yelpers have stated that although they are not vegetarian or vegan, they have enjoyed their meals here. For the vegetarian and the vegan – you now have the entire menu to order from!! Blossom is another restaurant in Chelsea (187 Ninth Avenue) and is part of the same family of restaurants as Cafe Blossom. I ate at this Chelsea location about 5 years ago, when I ordered a couple of dishes with seitan and tempeh and came to the realization that I do not enjoy these. If you want Blossom to-go, there are 3 outlets of Blossom du Jour in NYC, all serving healthy, organic food and beverages. Are there other vegan restaurants in NYC? I second every word! Great food and great company! Thanks, Shiri. You and your baby daughter are wonderful company anytime! The black-eyed cakes are my favorite!!! Inga – when we wrapped up lunch at Cafe Blossom, we spoke about our next lunch together at Peacefood Cafe. You seem to have read our minds. Thanks for your heads-up on the veggie dumplings too! Yes, Carmen, please visit soon!! We also love this place ! I’ve never been to Blossom, but that food looks amazing. Will definitely try it! Yes, please do, Lauryoga! And please share your thoughts here!! looking yummy coming there to have it …. Yes, MeenakshiKrishnan – please come soon! Lets enjoy the delicious food. I’ll be sure to check out the one in the W.Village one of these days. The food looks delicious! Sure, Ramya! Let me know if you need company to go to Blossom in the W Village. I am curious to check-it out and tocompare it with the UWS location.